1. Preheat the oven to 350 degrees F (177 degrees C). Grease a donut pan well. 2. In a large bowl, stir together the almond flour, monkfruit, collagen, baking powder, cinnamon, and sea salt. 3. In a small bowl, whisk together the melted butter, almond milk, egg, and vanilla extract. Whisk the wet mixture into the dry mixture. 4. Transfer the batter evenly into the donut cavities, filling them 3/4 of the way. Bake for about 23- 25 mins , until dark golden brown. Cool until donuts are easy to remove from the pan. 5. Meanwhile, in a small bowl, stir together the frosting for the coating save dried rose petals for the topping. 1. Add freeze dried strawberries to a high-powered blender or food processor. Pulse until strawberries are a fine powder. 2. Place a fine mesh strainer over a medium mixing bowl. Pour powdered strawberries through the strainer to remove most of the seeds or any small chunks that didn't break up. Set aside. 3. In a large mixing bowl, with a hand-held mixer, cream butter, honey, vanilla and arrowroot powder & collagen peptides on low speed until everything combines. Increase speed to medium-high and whip until it begins to turn a lighter white color, about 1 minute. 4. Stop mixer, scrape down sides if needed and add strawberry powdered mixture. Mix until fully combined. 5. Use to frost COOLED cakes. Prep all of the ingredients (except toppings) in a large bowl. After you cook these on skillet. Place in the oven to cook for 15 minutes. Are you a sucker for salty, crunchy, addictive chips? (And really, who isn’t?) Lucky you I came up with the perfect, all-natural swap: coconut “bacon” bites. The special seasoning makes coconut chips taste remarkably similar to bacon, but without all the saturated fat, cholesterol, and sodium. The flavor of bacon is easier to replicate than you may think. That’s because bacon itself is heavily seasoned and cured (nope, it doesn’t just naturally taste that way), so you can mimic that process to create bacon-like treats with a variety of non-pork foods. Preheat oven to 325 degrees. In a large bowl - add coconut flakes, drizzle the liquid aminos and syrup mixture and gently toss making sure to coat each flake well, about 45 seconds or so. Scoop the seasoned coconut flakes and place onto a lightly greased, or parchment paper lined, cookie sheet/s. Place in oven and bake for 20-25 minutes. Remove when coconut has a nice browned and caramelized color. Let cool, (it will get crispy as it cools). When we slow down we actually speed up and become more productive. I speak to leading meditation expert Emily Fletcher founder of Ziva Meditation today about her new book Stress Less, Accomplish More. Here is a yummy recipe inspired by my mom growing up! My mom introduced me to miso at a early age, I decided to bridge my two worlds of Asia and America! Into this Yummy Mushroom Miso Lentil Pasta! Bring a large pot of water to a rolling boil. Season generously with salt until it's nearly as salty as the sea, then add dried pasta. Cook the pasta until just under al dente (a minute less than on its package directions), then drain the pasta and set aside. Chop or pull apart the mushrooms into large, bite-sized chunks. Then, heat a large skillet over high heat with a tablespoon of vegetable oil, and sauté the mushrooms for 3-5 minutes until nicely browned. When they are done, add a little sherry vinegar to the pan with the mushrooms, give them a little toss, and set aside. It’s best to cook the mushrooms in 2-3 batches and not overcrowd the pan to allow them to brown evenly. To start on the sauce, whisk the red miso paste and butter together in a small bowl until it comes together to form a smooth, fluffy paste. In a medium saucepan, add the minced garlic and a tablespoon of oil, and stir-fry over medium heat for 30 seconds to a minute until fragrant. Add in the sautéed mushrooms. Then, add in the miso-butter mixture and cream, and bring this sauce to a boil, stirring gently. Finally, add the cooked pasta into the sauce, and stir until the pasta is well coated. Salt it to taste, and cook for 1-2 minutes until the pasta is al dente, then remove from the heat. Portion the pasta into two bowls, and top with sliced scallions and freshly cracked black pepper. From Dancing in the kitchen to talking about failures, Today on #KitchenHustle I interview one of my favorite people Marie Forleo. She has been featured on Oprah, interviewed by Tony Robbins, and mentored by Richard Branson. Marie is a powerhouse filled with so much heart and hustle. I have so much respect for her, so I thought who better to share how they FUEL their hustle starting in the kitchen then Marie Forleo. Below is our FULL RECIPE and all about B-School. It’s essentially a breakfast bowl with spinach on the bottom, broken up hard-boiled egg, slices of avocado, chopped tomato, chopped fresh basil, all sprinkled with some EVVO, squeeze of lemon juice, dash of crushed red pepper and Maldon salt flakes to taste. We are all constantly on the go these days, bombarded with social media, notifications, emails, technology slowing down is so essential to maintain a healthy lifestyle these days. Yes I get it we have things to get done, but we are not human “DOERS” , we are human “ BEINGS”, we need to slow down to keep up with the demands of our fast pace lives. This is why I believe meditation is so key to remaining calm, connected to our higher selves, and taping into observation rather than reacting to everything that comes at us. That email can wait, that text message can wait, you don’t need to react to every person. Take time to check in with yourself, take some time to ground yourself, what is your intention for the day? Are you in flow with your day, or are we allowing other people’s agenda’s to run us ? I share my some personal benefits meditation has down for me. Below I have also included some guided meditations I recorded for some of you wanting to wake up or end your day with some mindfulness. Take a 7 day challenge for meditating every morning and see how you feel. There is also such thing as active meditation, such as yoga, walking, making tea, we don’t always have to be in a lotus position. Main point is, take time for you! Honor your spirit! NFL Super Bowl LI is coming up! Are you rooting for PATRIOTS or FALCONS? I grew up always excited for Super Bowl Sunday, not particularly because of Football but because I knew this was a time of getting together with friends and family PLUS all the YUMMY foods. To be honest I don't even know how football really works haha, BUT I love watching the performances and making food for my friends and family. I am sure you are getting ready for a social gathering, and not sure what to bring to your potluck! I got you covered with YUMMY & SIMPLE recipes! Here are my TOP 7 Favorite Super Bowl Sunday Munchies! Growing up my mom used to make this for me and my sister! it was such a treat, so many bold flavors, not to mention veggies with beautiful turmeric and curry spices. Hope you give this a shot, I shared this with Hallmark’s Home & Family below is the recipe. 1. If using whole coriander, cumin seeds, and black peppercorns, add to a small skillet and toast over medium-low heat for 4-5 minutes, shaking / stirring occasionally, or until fragrant and slightly deeper in color. Be careful not to burn! If using powder, skip this step. Once seeds are toasted, add to a mortar and pestle and loosely crush. If you don't have a mortar and pestle, slightly cool the seeds, add them to a sandwich bag, and crush with a rolling pin or a heavy pan. Set aside. To a food processor (or blender with a narrow base), add green chilies, bell pepper, garlic, lemongrass, ginger, green onions (or shallot), coriander, cumin, black pepper, turmeric, sea salt, lemon juice, lime zest + juice, oil / water, and maple syrup (or other sweetener). Blend / mix until a paste forms, scraping sides down as needed. The lemongrass can be difficult to grind at first, but give it time! It's fine. Taste and adjust flavor as needed, adding more lime zest or juice for acidity, salt for saltiness, chilies for heat, maple syrup for sweetness, oil (or water) for creaminess, garlic for zing, ginger for brightness, or turmeric for more intense curry flavor. 1. Make green curry paste ahead of time. Also cook quinoa in veggie broth and add in lemon grass for extra fragrance. Set aide. 2. Start with coconut oil/ghee in deep pan add in garlic, onion, and green curry paste. Cook for 3-4 minutes add in tomato paste, coconut milk. Add in pepper, fish sauce, choice of protein, lemon juice, mushrooms, green & red peppers, ginger, sprinkle cayenne. 1/4 cup dried Blue Butterfly Pea Flower Tea flowers, food grade. 1 teaspoon wildflower honey, amount to taste. 1 teapsoon lemon or lime juice, fresh squeezed, amount to taste. 2 lemon or lime slices or wedges, to garnish. 2 cups ice cubes, if serving iced, amount to taste. Thanksgiving is almost here! Here are 10 of my yummy thanksgiving friendly recipes! ENJOY! Here’s a FUN yummy way to #MealPrep during the week. I make sauces separately and combine when ready to eat! Quinoa, Corn, Bell Peppers, Tomatoes, Black Beans. Save the avocados and hemps seed topping for when you are ready to eat. Get creative with each jar! It’s that SPOOKY time of the year! Halloween is here, this means staying committed to our healthy goals and also not depriving ourselves. I have picked my top 5 favorite halloween recipe swaps for this season. ENJOY! Evenly spoon the nut butter mixture into the frozen chocolate cups. Preheat the oven to 350 degrees F. Line a muffin tin with 8 paper cups and spray the insides with coconut oil spray to prevent sticking. Whisk together the coconut flour, cocoa powder, baking powder, and salt in a large bowl. Add in the eggs, maple syrup, coconut oil, almond milk, and vanilla. Stir well to combine. Fold in the chocolate chips. Divide the batter equally into the muffin cups. Bake for 15-20 minutes, until a toothpick inserted into the center comes out clean. Place the muffin tin on a cooling rack and allow to cool for 10 minutes. Remove the cupcakes from the tin and cool completely before adding the frosting. To make the frosting, stir together the coconut cream, pumpkin puree, maple syrup, cinnamon, and vanilla in a small bowl. Place in the refrigerator for 30 minutes to chill. Frost the cupcakes once they have cooled. With a large stand-up or hand-held mixer with a whisk attachment, beat the eggs and pumpkin puree on high until doubled in size. Add the coconut oil and vanilla stevia and beat until incorporated. Mix all of the dry ingredients together in a bowl with a metal wire whisk making sure to break up and clumps of almond flour. You can also sift the almond flour through a fine mesh strainer or tami before adding it to the rest of the dry ingredients. Turn the mixer on low and slow add in the dry ingredients stopping occasionally to wipe down the sides with a silicone spatula. Once all the dry ingredients are in, turn the mixer to medium and whisk until just incorporated. Do NOT over beat! Once all the dry ingredients are incorporated stop mixing. Grease a baking sheet tray with coconut oil or use non-stick baking pad. Bake them for 8 min if you want moist, soft cookies or 10-12 minutes for crispier ones. Remove them from the oven and allow to cool ON the sheet tray for 15 min before removing them to a rack to cook completely. 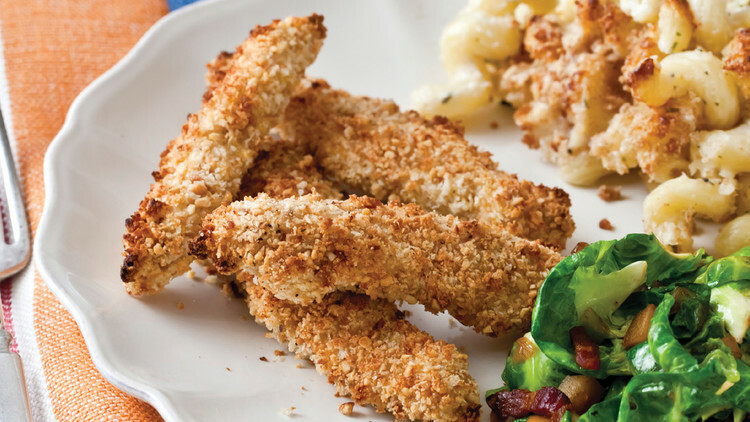 These easy, crispy baked chicken tenders are covered in chickpea crumbs rather than breadcrumbs, for a higher fiber, lower carb delicious meal! They are the perfect blend of crispy, flavorful coating and a moist, delicious inside. Served with my favorite Ellyndale Q Cups. 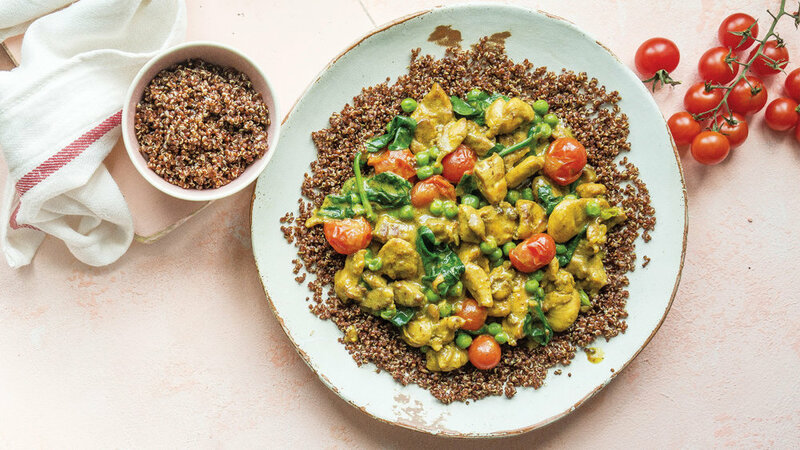 A healthy yet tasty alternative to fast food. Pair with your favorite dipping sauce! In a medium bowl, mix eggs and milk. In another medium sized bowl, mix together chickpea crumbs and seasonings. Dip each chicken tender one by one into the egg mixture, then cover both sides with seasonings to coat. Place on baking dish. Repeat for each chicken tender. Mix in a bowl, dragonfruit, powdered erythritol, mct oil, until silky smooth. Mix donut batter ingredients until no lumps. Place into non stick donut baking sheet. I spray or whipe the pan with coconut oil so there’s no stick. Add in batter, and bake at 350 for 8 mins on each side. Let donuts cool, and apply dragonfruit keto glaze. Then add coconut shreds.